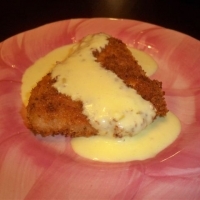 Panko crust provides a crunchy texture for the chicken, which goes great with the spicy cream sauce. With a meat mallet, pound each chicken breast to ¼-inch thickness. Trim fat and cartilage from breasts, and cut into serving cutlets. On a plate, combine breadcrumbs, salt, pepper and garlic powder. Dip each chicken cutlet into breadcrumb mixture, pressing breadcrumbs firmly into chicken to cover evenly. Pour enough olive oil into skillet to cover, less than ¼-inch. In batches, pan fry breaded cutlets until evenly browned on each side. Place cutlets on baking sheet in 300 degree oven while you’re pan frying the subsequent batches and making the sauce. Put cream cheese, heavy cream, milk and chicken base into saucepan. Turn heat to low to medium low. Whisk until all cream cheese is fully melted and the sauce is smooth. Add chopped jalapenos and blend using an immersion blender until the sauce is smooth and turns green. Made it last night. WOW! I'll be making this again soon! Absolutely love the sounds of the jalapeno sauce over the crispy chicken - aren't panko crumbs the best?!? Printed this off to make next week...can't wait to try it - thank you! Great recipe. I can usually find thin-cut chicken breasts at Safeway, so I can skip the pounding step, and I just about always use Panko instead of breadcrumbs. This sauce sounds delicious. HIGH 5. This sounds amazing. Can't wait to try. Great post and a high 5. Like twistedsister's recipes? Never miss an upload!